Thanks to Dryden Hawkins for sending me this CD.
" 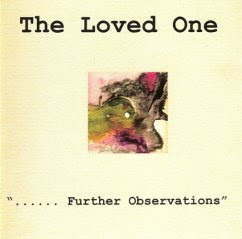 ...... Further Observations" is The Loved One's 2nd album, a cassette-only release from 1982. It contains recordings from 1979 to 1982 of which the title track is the definitive version of the track 'Observations' that appeared on the Some Bizarre comp. album. I posted their 3rd album "Locate And Cement" a few years ago. This album is somehow more accessible and less experimental than "Locate And Cement" but it has that typical The Loved One sound. All the albums will be remastered and reissued in the coming years so watch out for these. A new album "SET" will be released next year. The Mirror Crack'd - Friends 7"
UV Pop - Music To Yeah To 12"
La Valse - Winter/Sorrow 7"
Relevement '82 - Red Hair/Glad Song 7"